Sharing the beauty of inquiry-based learning with teachers in mainstream primary schools. 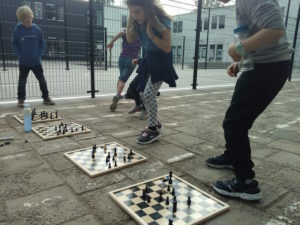 That’s the task International School Utrecht teacher Anssi Roiha set himself last spring. Enlisting the help of his ISUtrecht colleagues, the book turned into a true community project with teachers keen to share good practices. Educating for the future will be ready for publication at the end of this academic year. Together they came up with the (working) title: Educating for the future: Lessons from an IB world school. A book that will cover a wide range of future needs and how they can be addressed through education. In the rationale for the book Roiha and Wiseman state that: ‘competencies and expertise required in future societies and working life have changed quite drastically and rapidly’ over the past years. The book, written by teachers for teachers, will provide ‘a multitude of practical examples from the classroom backed up by some theory and literature’. Roiha was born and raised in Finland, and before moving to the Netherlands he was teaching children with learning difficulties and other special needs in a variety of Finnish schools. 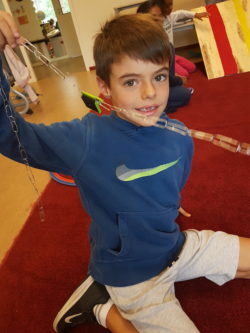 One of the key concepts of Roiha’s teaching philosophy is differentiation and he always aims to provide each learner with successful learning experiences. Roiha currently combines a role in student support at the ISUtrecht with finalising his Ph.D on CLIL education (Content and Language Integrated Learning) for the University of Jyväskylä, Finland. Intern and teaching assistant Kris Coorde, together with colleague Wychman Dijkstra are currently delving into ‘computational thinking’ with the students in grades 1 and 2. Coorde: ‘Computational thinking is a skill set that teaches children to look at problems from a logical angle and have them try to solve these problems as if they were a computer. Think of planning, giving and following clear instructions, problem solving, decomposing large problems, using patterns and algorithms. 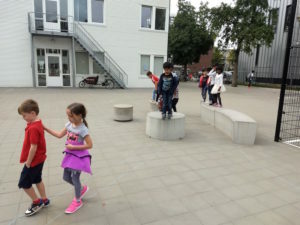 We started with simple exercises on the playground, then continued with simple codes and are now moving on to patterns.’ Coorde and Dijkstra are so keen to share their expertise, they even started blogging about computational thinking, providing their audience with lots of hands on ideas for lessons. The infectious enthusiasm of the collaborating teachers is exactly what Roiha had in mind when he started this project. ‘It will be a book of different styles and voices’, he says, ‘And that’s ok. Teachers writing about their passions, interests and giving lots of practical examples is exactly what I envisaged.’ Roiha who currently targets various publishers aims to have the manuscript ready for publication by the end of this academic year. So, watch this space!